Often referred to by its full title, Washington State, to distinguish it from Washington, D.C., Washington  offers rugged coastline, deserts, forests, mountains, volcanoes, and hundreds of coastal islands to explore. The Cascade Mountains bisect the state, with the damp forested coastal areas to the west, and pineforests, deserts and irrigated farmland of the Columbia River Plateau to the east. located on the southeastern side of the Cascades; this region features canyons, deserts and steppes set in hillside valleys. Cities included within this region are Kennewick, Walla Walla, and Yakima. Olympia — State capital located within the fast growing South Sound area. Bellevue — Seattle's suburban cousin across Lake Washington, a commercial center with a growing downtown area. Bellingham — Home of Western Washington University. Near the Canadian border and Vancouver, B.C. Seattle — Largest city in the Pacific Northwest. Home of the world famous coffee chain, Starbucks. Spokane — The heart of Eastern Washington, unofficial capital of the Inland Empire. Tacoma — Port city with several good museums downtown. Vancouver — Just across the Columbia River from Portland, Oregon. Not to be confused with the Canadian city. Walla Walla — Small eastern city in the heart of Washington's blooming wine country. Yakima — Located in the Yakima Valley, the major agricultural and wine region of the state. Lewis and Clark National Historic Trail - Between May 1804 and September 1806, 32 men, one woman, and a baby traveled from the plains of the Midwest to the shores of the Pacific Ocean. They called themselves the Corps of Discovery. Nez Perce National Historical Park - consists of 38 sites to the east of Lewiston; most in Idaho, but some in Washington. The legal driving age in Washington is 15 on a learners permit, if enrolled in "Behind the wheel driver training" otherwise it's 15 and 6 months. 16 on a restricted license, and 17 with perfect driving record for the first year, otherwise it's 18. For the first year, no driving between 1 a.m. and 5 a.m. unless with a licensed driver age 25 or older. Traffic violations in the state are severe. Drive on the right side of the road! Oncoming traffic comes from the left and you must cross oncoming traffic when turning left. An international drivers license will usually allow you to drive legally for a few months. The drinking and purchasing age of alcoholic beverages in Washington is 21 years old. You must be 18 years of age to legally smoke. Understand that it is ILLEGAL in Washington state to smoke in a workplace, restaurant, bar, bowling alley, non-tribal casino, and (technically, though everyone does it) bus stop. Smoking is also banned within 25 feet (8 meters) of a door or window that can open or a ventilation intake. While Washington is often portrayed (as well as Seattle) as an extremely rainy place, the climate of Washington is actually very diverse. The part of the state east of the Cascades is quite dry and arid. In the Puget Sound area, it rains some, but not as much as many other major cities. Here especially, the weather can change very fast. The west coast of the Olympic peninsula is the rainiest part of the state. Most people in Washington speak English with a Pacific Northwest accent. This accent is considered very similar to general American. Washingtonians generally have little to no problem understanding different accents of the English language. Washington is the thirteenth most populated state, but by comparison has the fourth highest Asian population. You may be able to find a Japanese or Chinese speaker, especially in the Seattle area. There is also a large Hispanic population. In some small towns east of the Cascades more than 50% of households speak Spanish at home. Seattle-Tacoma International Airport, (IATA: SEA), called "SeaTac" by locals, connects Seattle to all regions of the world, with especially frequent transpacific routes. Competition is heavy on busy San Francisco Bay Area and Southern California routes. Non-stops to the following countries: Canada, China, United Arab Emirates, France, Germany, Iceland, Japan, South Korea, Mexico, Netherlands, Taiwan, and the UK. Transfers are required from the Caribbean and Central and South America. Spokane International Airport, (IATA: GEG). Most flights go to Seattle, Portland (Oregon), Boise, Oakland (across from San Francisco), Salt Lake City, Los Angeles, Denver, Phoenix and Minneapolis. Seasonal flights to Chicago. 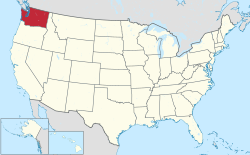 Portland International Airport, (IATA: PDX) is just one mile across the state line in Oregon from Vancouver. For Southwest Washington (i.e. anything south of Chehalis along I-5 exit 77) this is the (next) nearest major airport. One daily non-stop from Tokyo, Amsterdam, Calgary and Guadalajara. Plans are underway to include additional flights to Los Cabos, Germany and Iceland with additional airlines. Vancouver International Airport (IATA: YVR) is in Canada 27 miles (44 km) from the border in Blaine/Surrey which is the border crossing to the USA from Canada. You will need the proper travel documents to (re)enter Canada and the U.S. to cross the border. For U.S. residents, going through customs twice probably isn't worth it unless you also want to visit Vancouver so the next nearest American airport is in Bellingham (see below). For Canadians wanting to go to the San Juan Islands it may be the best choice. There are also direct international flights to/from Europe, Mexico, Cuba, Australia, and Asia. For travel across Canada the total airfare may come out cheaper for one to cross into the United States by Greyhound or by another bus line, fly across the North American continent and go back up into Canada on another bus, then fly across Canada as Air Canada has a near monopoly on domestic travel. For, example to get from Toronto to Vancouver one may take a bus from Toronto to Buffalo, fly across the United States to Seattle and continue on another bus to Vancouver. Bellingham International Airport (IATA: BLI) is a regional airport about 90 miles north of Seattle and 60 miles south of Vancouver, Canada. Allegiant and Alaska Airlines have jet service to Las Vegas, Los Angeles, Oakland, Mesa (near Phoenix), San Diego, Honolulu and Palm Springs (seasonal). There are many shorter flights (mostly to Seattle) with turboprop aircraft. Tri-Cities Airport (IATA: PSC) is a commercial airport located 2 miles northwest of the city of Pasco and is the third largest commercial air terminal in the State of Washington. Flights go to Seattle, San Francisco, Los Angeles, Las Vegas, Mesa (near Phoenix), Salt Lake City, Denver, and Minneapolis (seasonal). Horizon Air (which links to Alaska Air) has flights to five small cites in or near Washington State with infrequent daily service to Seattle-Tacoma. The Coast Starlight . Regarded by many as America's most scenic train ride, the Coast Starlight runs between Los Angeles, California, and Seattle, Washington, stopping at many Washington towns including Seattle, Tacoma, Lacey/Olympia, Centralia, Kelso/Longview & Vancouver, WA. Amtrak Cascades . The Cascades is a special service that operates between Seattle and Portland 4 times (6 times beginning in fall 2017) round trip daily. Twice daily from Seattle to Vancouver, BC and from Portland to Eugene using special high-speed Talgo rolling stock. 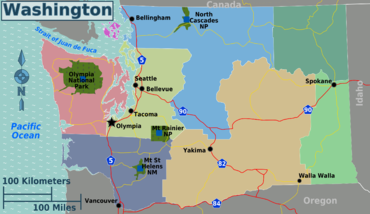 Washington stops include Bellingham, Mt Vernon, Everett, Edmonds, Seattle, Tukwila, Tacoma, Lacey/Olympia, Centralia, Kelso/Longview & Vancouver, WA. Additional service to Eugene & Vancouver are on the Thruway Motorcoach buses. Interstate 5 and the Peace Arch  crossing is the main land port-of-entry to Washington from Canada. However this is only one of five land crossing points between the Lower Mainland region of BC and the Northwest Cascades region of Washington. See the Get in — by car section of Northwest Cascades region article for details. Interstate 5 (and Interstate 205) provide access from the greater Portland area. Interstate 82 / US 395 provides access from eastern Oregon to the tri-cities area of Eastern Washington. For a more scenic entry, try taking US Route 101 along the Washington and Oregon coast, but be aware for the numerous speed traps in the small cities. Greyhound  has a number of bus stations throughout the state in metropolitan areas as well as the smaller micropolitan areas by way of the main interstate highways (5, 82 & 90). Passengers transfer buses in Missoula, MT; Portland, Seattle, Salt Lake City or Sacramento to get to where they're going. Most people get around the state by private automobile or buses but flying is still available if you're in a hurry to get there. Intrastate service is only offered by Alaska Airlines (Seattle, Portland and various destinations in the state) and Delta (Seattle, Portland & Spokane). All of the state's major east-west highways cross over the Cascade Mountains, which are subject to closure, delays, and studded tire or chain requirements in wintertime. In severe weather, it may be better to use I-84 just across the border in Oregon. This route goes through the relatively low elevation of the Columbia River Basin. On rare occasion, I-84 may also have weather-related problems where it passes north of Mount Hood. A 20-mile detour on Washington State Hwy 14 is available between I-84 Exit #44 Bridge of the Gods, and Exit #64 Hood River Bridge. Both have a small toll. In urban areas (especially in Seattle) getting around by bus is fine but for most places, especially in small towns and in rural areas having driving is a must as (local) bus services are limited. Greyhound, , travels primirarly along Interstate 5, 82 & 90 and along US Hwy 395 between Pasco & Ritzville. Along I-5 buses go between Seattle & Portland via Tacoma, Olympia, Centralia, and Kelso and between Seattle & Vancouver via Everett, Mt Vernon & Bellingham. Along I-90 buses go from Seattle to Missoula, MT (via Ellensburg, Moses Lake, Spokane, etc) and southeast to Stanfield, OR (via Ellensburg, Yakima, Sunnyside & Pasco along I-82. Along US 395 buses go from Pasco up to Ritzville & over to Spokane along I-90. Passengers typically transfer buses in Seattle, Portland, Spokane, Sacramento, Missoula, Pasco , Stanfield and Vancouver to continue to other cities. Bellair Airporter,  goes from SeaTac Airport up to Lynden and Blaine via Stanwood, Marysville, Mt Vernon,Burlington and Bellingham on one route and over to Yakima via North Bend, Cle Elum and Ellensburg on another route. From Burlington they have a third route going across to Anacortes and the San Juan ferry terminal. BoltBus, . Direct service from Portland, Seattle, Bellingham and Vancouver, BC. Buses stop at 5th Ave S and S King St next to the International District/Chinatown transit station. Fares $1-20. Northwestern Trailways,  goes from Spokane to Seattle, Leavenworth, Wenatchee, Coeur d'Alene, Boise, Pullman & Lewiston on multiple routes as well as operating the 'Travel Washington - Apple Line' bus between Ellensburg and Omak along US 97 . Quick Shuttle, . Runs between the airport in Seatac Airport to Vancouver via downtown Seattle, Tulalip & Bellingham. Washington Dept. of Transportation Transit List'  provides a list of urban and rural public transportation providers throughout the state. In some parts of the state such as the Olympic Peninsula, the Northwest, and South Sound using these public buses are the only thing available to get around without a car. Washington State Ferries  is the largest in the country. It has routes across Puget Sound and to Bainbridge, Vashon, Whidbey and the San Juan Islands. Inland, the state also offers some free ferries across the Columbia River. There are also some county-run ferries to smaller destinations such as to Anderson Island and Guemes Island. Many ferry destinations are not islands without a bridge, but peninsulas where going by land would involve a very long detour. The most extreme example of this is the Port Townsend -- Keystone route on State Hwy 20. Only five and a half miles via the ferry, becomes a whopping 217 miles (354 km) traveling by car! Amtrak Cascades . The Cascades is a special service that operates between Seattle and Portland 4x daily. Twice daily from Seattle to Vancouver, BC and from Portland to Eugene using special high-speed Talgo rolling stock. Washington stops include Bellingham, Mt Vernon, Everett, Edmonds, Seattle, Tukwila, Tacoma, Lacey/Olympia, Centralia, Kelso/Longview & Vancouver, WA. Additional service to Eugene & Vancouver are on the Thruway Motorcoach buses. Sound Transit Sounder  runs commuter trains between Everett-Seattle and Seattle-Tacoma-Lakewood on two separate routes. Go fishing for Salmon,Trout, Albacore Tuna, or Bottomfish while visiting Washington both fresh water and Saltwater opportunities available. Washington State offers some of the best fishing in the United States. There are several types of fishing opportunities available in both Saltwater and Freshwater. Salmon and Steelhead are among the most popular fish to pursue and there are several guides to help travelers enjoy the thrill of catching trophy size fish." Washington state is a great place for seafood, with salmon in particular being a specialty. As with almost everywhere else in the U.S., the legal drinking and purchasing age of alcoholic beverages is 21. And as with most states, Washington uses loopholes in the federal law to allow underage drinking. Underage drinking of alcohol is allowed on private non-alcohol selling premises with parental consent. Underage drinking is allowed for religious purposes. Anyone under the age of 21 shall not be prosecuted for underage drinking if the underage drinker is succumbed to alcohol poisoning and is in need of medical assistance, but for obvious safety reasons this method is not recommended. Washington is also the home to well-crafted local wines  and "microbrewery" beers. The western part of the state tend to be more tolerant to the LGBT group than the eastern part which is more conservative. Washington has a large Asian population that is concentrated mostly in the western part of the state. Some understanding of the corresponding customs and culture may serve you well in these areas. Also, do not assume that no one around you speaks English (chances are they do, so watch what you say). Law enforcement in the state is under control of the Washington State Patrol. In the Cascade Mountains (which divide the state into halves) there can be significant snow accumulations during the late fall and winter months. This poses a danger for avalanches whenever these areas experience warm up periods, regardless of how brief they may be. Mountain passes are sometimes closed for avalanche control and may affect travel plans, especially along I-90 from Yakima to Seattle. Check the Washington State Department of Transportation website  for information regarding Avalanche control. If going into the mountains during winter and early spring months, refer to the Northwest Weather and Avalanche Center website  for information regarding the current avalanche dangers throughout the Cascade region of the state. Much like any state in the United States, Washington is generally safe provided that you use common sense and keep your wits about you. Certain areas of Seattle, Spokane, Tacoma, and Yakima can become seedy after dark and it is therefore advised that one avoid being out alone very late at night; this is especially true in unlit places where you are an easy target for any crime or other illegal activity. Parks in the urban areas of western Washington are not places to be at night unless you are seeking trouble. Stay to the main tourist areas of the state during the day and you will have a great visit. East of the Cascade Mountains, the state's terrain begins to turn into desert and temperatures often exceed 100 degrees Fahrenheit in regions such as the Yakima Valley and the Columbia River Plateau. If are planning on hiking into these locations, follow desert survival guidelines. Be sure to take plenty of water (at least one gallon per person, per day), sunscreen and wear light clothing. Let someone know where you are going and when you expect to get return. Volcano safety is, to put it mildly, a controversial subject; see the article on Volcanoes (and, particularly, its discussion page) for some of the issues. Washington state is home to five major, ACTIVE volcanoes, plus one just across the border in Oregon: Mount St. Helens (1980), Mount Rainier (1894) (which is considered to be one of the most dangerous volcanoes in the world), Mount Baker (1880), Mount Hood, Oregon (1866), Glacier Peak (c. 1700), and Mount Adams (c. 550 B.C.). The majority of these are considered to be tourist destinations, particularly Rainier and St. Helens. If planning to visit one of these locations, FOLLOW the policy regarding any road and/or trail closures that at first glance may appear unnecessarily conservative -- but it is not. Believe it. The closures aren't there simply to inconvenience and irritate you. If a trail is closed due to eruptive hazard, stay off the trail. Warning to anyone who is a non-U.S. citizen traveling from Canada. Even though Cannabis is now legal in the State, U.S. Border guards still obey federal law, where Marijuana is still illegal, so anyone trying to cross the border to the U.S. who discloses plans to try cannabis in the state could be denied entry into the U.S. or barred entry indefinitely. Guards will still be allowed to ask travelers whether they plan to buy legal marijuana. The U.S. department of justice allows Indian Reservations to regulate cannabis on their land. Because of this, Some Indian Reservations in the state may not allow cannabis on their land, such as the Yakama Nation, located in southern Washington. Bringing cannabis into any reservation that doesn't allow it will have indian reservation and federal law applied. This page was last edited on 7 July 2018, at 17:46.